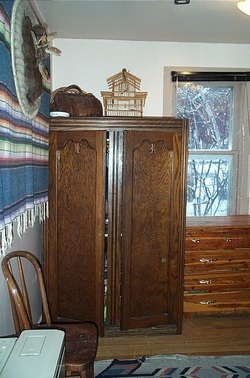 An ordinary old-fashioned armoire closet. "Nothing to see here, citizen; move along." But WAIT! Behind the ordinary old-fashioned armoire, a stash of canned goods, conveniently stored in a temperature-stable environment free from the danger of getting wet or freezing solid. 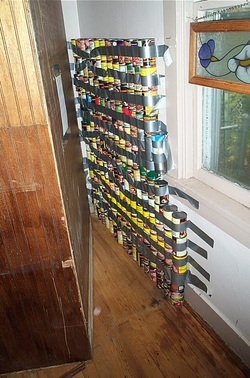 With the stack of duct-taped cans exactly as high and as wide as the armoire, several hundred cans take up only a three-inch strip of the bedroom floor. Presto-chango; now you see it, now you don't. Here you have a nice pine-lined closet using cheap boards picked up at the Re-Store for fifty cents each. Continue adding soup cans and more boards all the way up to the ceiling. It makes a nice storage space without using up a single square inch of living space, or crowding kitchen cupboards with excess cans. Continue on the OTHER side of the closet. There's a locally owned grocery store in my town that has *fabulous* case-lot sales several times a year. Every time, I'll pick up an extra case of canned something-or-other, stack 'em up in the closet, then stop by the Re-Store for boards to hide them. This is also another great way to store extra lumber for all those post-disaster broken windows and damaged roofs! 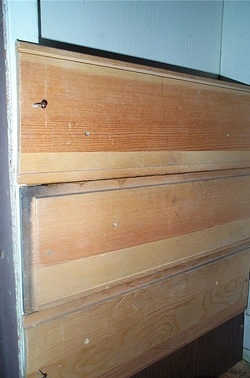 Zombie-proof your home using boards stored like this in your closet. Be sure to attach them using screws rather than nails so they can be easily removed. If you have to flee the house leaving the stash behind, take the screwdrivers with you in order to deter casual looters.